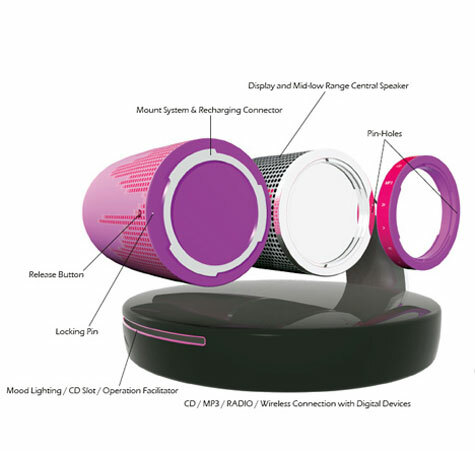 The central component includes a display with a built-in speaker for the mid-low range. The attached parts are connected via elaborate joints that are detachable and strong enough to withstand 2kg of weight, similar to camera lens mounting systems. Each speaker can be programmed automatically into right and left channels, regardless of whether or not they are directly attached to the main component. 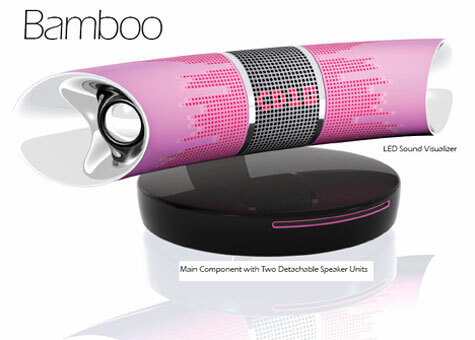 When fully charged for 2 hours, the speakers can function independently for up to 12 hours. The remote control is a bangle style control system. If one hugs an assembly consisting of the two speakers and the bangle control while sleeping and listening to the music, one can experience the simultaneous pulsation of both vibration and sound which is akin to one’s heart beat. This combination provides soothing warmth, similar to that of an intimate friend or close family member. In addition, the soft music vibrations enable one to awaken gently in the morning.